Jocelyn grew up in the Seattle, WA area and showed an interest in photography when she joined a photography club in middle school. Many years later she went on to receive her BFA in Photography in August of 2016 at BYU in Provo, Utah. Once she planned her own wedding in 2014 she fell in love with everything related to weddings. She is now starting her 5th season shooting weddings with 100+ weddings under her belt. She loves being the person to provide images to couples that will last a lifetime. Outside of wedding photography Jocelyn enjoys spending time with her husband Josiah, teacup poodle Finn, and newborn daughter Willow. She also enjoys dancing and teaching ballet, hiking, and yoga. Katie was born and raised in Huntsville, Alabama. Her interest in photography started in middle school when she received her first camera as a birthday gift. By the time she got to high school, she joined the photography club and started learning the in’s and out’s of photography, where she fell in love with film. Katie went on to receive her BFA in Photography and Painting in May 2013 at Birmingham-Southern College. Immediately following, she got her MFA in Photography at The University of Memphis in May 2016. She has since moved to Lynchburg, Virginia in August 2017 and is loving life! She loves capturing all of life’s beautiful and priceless moments! Aside from her passion for photography, here are some fun facts about her. She is a triplet, loves all the coffee and Chick-fil-a she can get, and is an avid TJ Maxx and Target shopper! Mikayla currently lives in Lynchburg, Virginia but grew up in a small town in North Carolina. She is very passionate about storytelling and is so in love with the fact that she has found a career that combines her two biggest passions -- storytelling and traveling. She is so grateful that she gets to take part in designing and capturing beautiful imagery. Other things about her: she is a big coffee drinker, she is an enneagram 4, and she loves living in the mountains! Nate grew up in Lynchburg Virginia and devotes all of his time to storytelling through the medium of film. He loves the culture that surrounds weddings and filming them. He loves being able to work together with brides and people on the biggest day of their lives. He has been filming weddings since 2014 and wedding filmmaking continues to be a growing passion of his. When Nate is not filming he loves to travel, run races and go hiking! Sarah is a newlywed, adventurer, and food enthusiast. When she is not behind the camera, you can usually find her exploring the world with her Mr., making sure the fur babies live their best life, reading up on enneagrams, enjoying tacos & salsa at trivia night, or watching true crime documentaries. 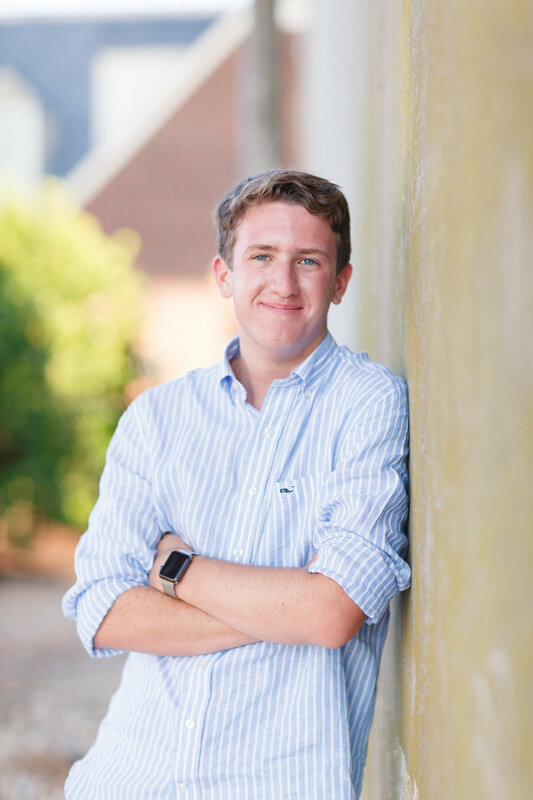 Michael grew up in Williamsburg, Virginia where his interest in filmmaking sparked at the young age of 6 years old. He’s loved the medium of video for as long as he can remember and truly believes in the power that video has in creative storytelling. He has been filming weddings since 2015 and loves every aspect of it and the people he gets to meet! When he’s not behind the camera, he loves to travel. Being able to explore new cultures and cities and capturing the beauty of the world he lives in is something that makes him happy. Claire is local to Lynchburg, Va. She has been taking photos since she was 8 years old, and has been shooting weddings for 3 years. She loves the outdoors and the mountains, and she LOVES capturing love!